Wild Flag On World Cafe : World Cafe The explosively energetic foursome treats World Cafe to its fusion of raucous punk and tight musicianship. Perhaps Wild Flag's burgeoning success is due to the fact that each member is a valued veteran of the indie rock scene, with collective stints in The Minders, Sleater-Kinney, Stephen Malkmus and the Jicks, The Spells and Helium. 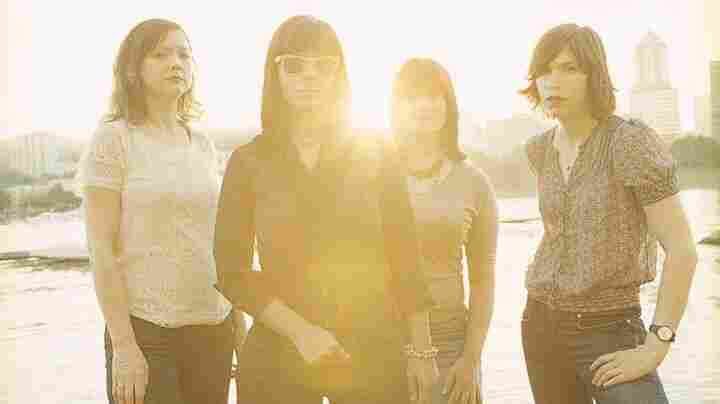 But once Carrie Brownstein, Mary Timony, Rebecca Cole and Janet Weiss begin to perform, it's clear that the attention the band has earned for its explosively energetic live shows and the killer single "Romance" is due completely to the chemistry and dedication of these four musicians. Brownstein, a former NPR Music blogger who also created the TV show Portlandia, credits the participatory nature of her blog for inspiring her return to the stage. Though Brownstein and Weiss had played together before in the power trio Sleater-Kinney, Wild Flag began when its members worked together on a movie soundtrack. They discovered strength in the stylistically different but complementary collaboration of lead singers and songwriters Brownstein and Timony. Their leadership has bred the fusion of the raucous punk and tight musicianship heard in their self-titled debut, songs from which they perform on today's World Cafe.